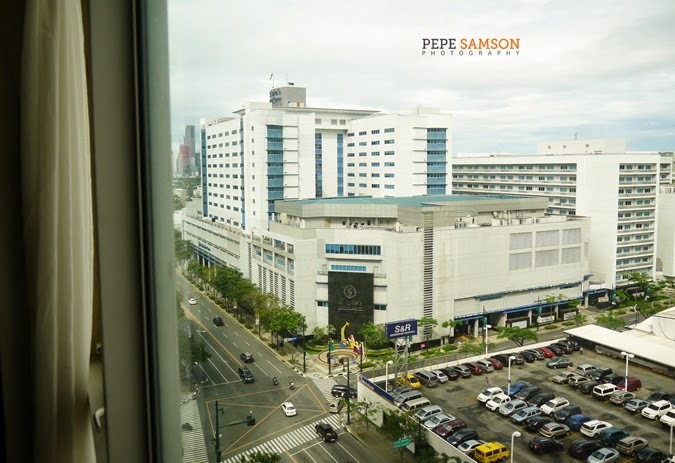 I had just landed in Kalibo when my fellow blogger and Instagram friend B’ley* of Blogalag.com sent me an SMS, inviting me to a staycation at F1 Hotel in BGC. I’ve never been invited to a staycation with fellow bloggers before, so this got me totally excited! 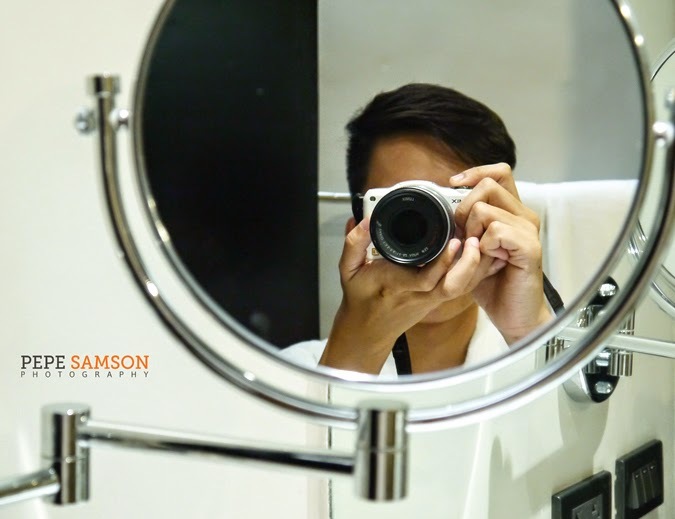 Not only was I going to spend the weekend in BGC’s premier hotel, I was also going to meet fellow foodies and bloggers! Yeah! I remember going to F1 Hotel two years ago—for our company Christmas Party. The hotel was relatively new back then (it used to be Best Western Premier Hotel). We enjoyed every moment of our Fire and Ice Christmas party; everyone came in dressed either in red or blue, and we all just danced the night away! 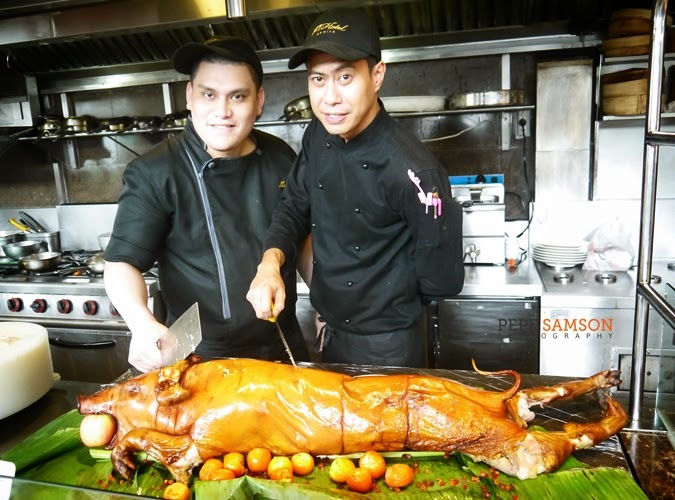 My partner and I did a "hot" Rumba number, then stuffed our mouths like pigs with F1’s sumptuous food, haha! Truly, a memorable night! Two years ago. I MISS MY FLAT STOMACH! Well, who would have thought that two years after, F1 Hotel will be having its very own Fiery and Frosty Christmas? I’d like to think it was inspired from our dance number (kidding, haha) but F1’s Yuletide offering is much more awesome. 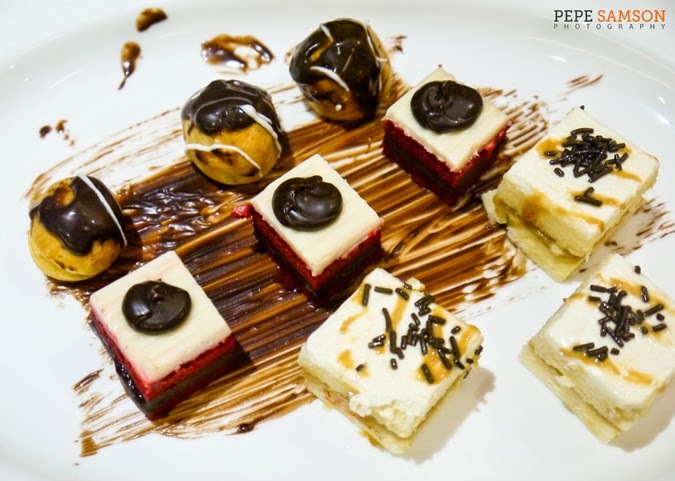 A relaxing treat for the family—or for any loved-one you would like to share happy moments with. A respite from holiday-induced stress ... who could say no to that? I know I couldn’t! 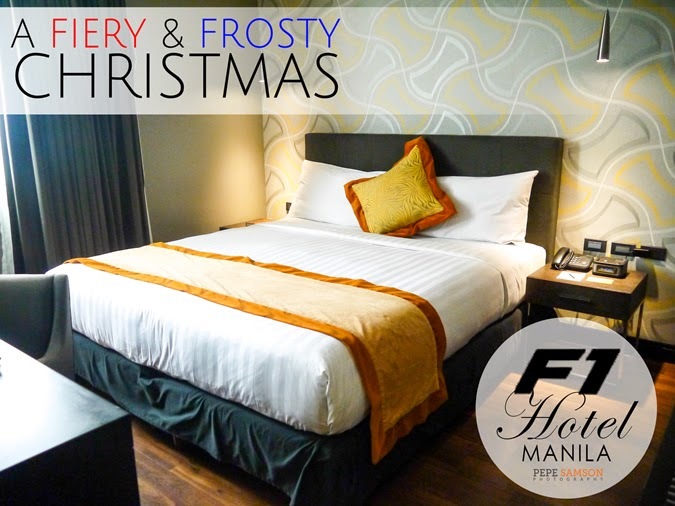 And I couldn’t wait to show you either how a Fiery and Frosty Christmas at F1 Hotel is like—so here you go! I'll let the photos do most of the talking! Before checking in, we assembled in F1 Hotel’s Premier Lounge and got to chat with other bloggers over some pastries and coffee. 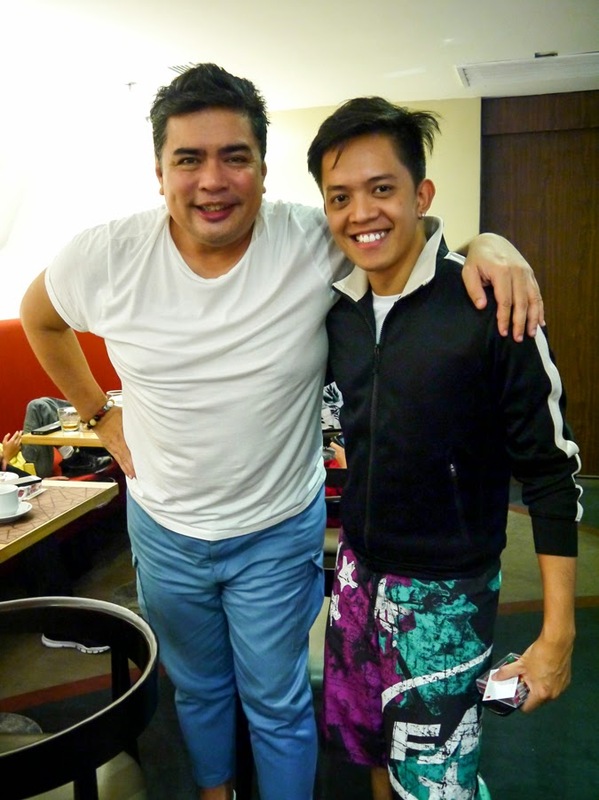 Renz (A Not so Popular Kid) was present, as well as Camille (The Soshal Network), Jazmin and family (EricJaz Foodies), and of course Spanky—to name a few. F1 Hotel’s Operations Director, Tony Co, was also there to warmly welcome us. 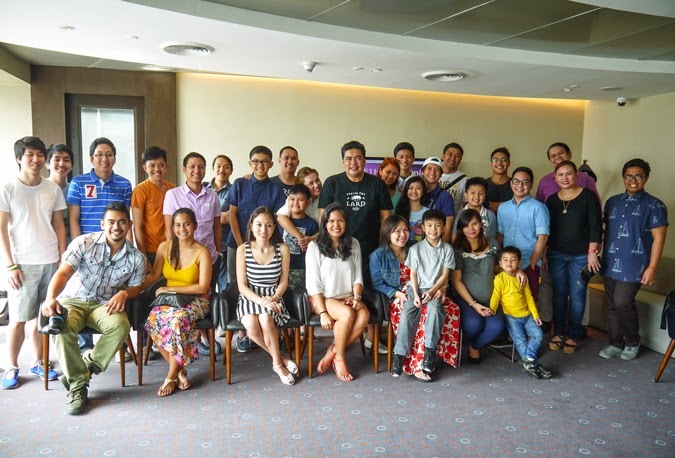 Pau familiarized us with our “itinerary”—which to me translated into 24 hours of pure relaxation—and afterwards we had our “class picture”! I was so happy to be among a bunch of other bloggers as crazy as I am. After the get-to-know-you session and after checking in, we were ushered into the nicest room ever. F1 Hotel’s Fort Suite had a queen-sized bed, two flat-screen TVs, a mini-bar and nook, a work station, and a separate living room. 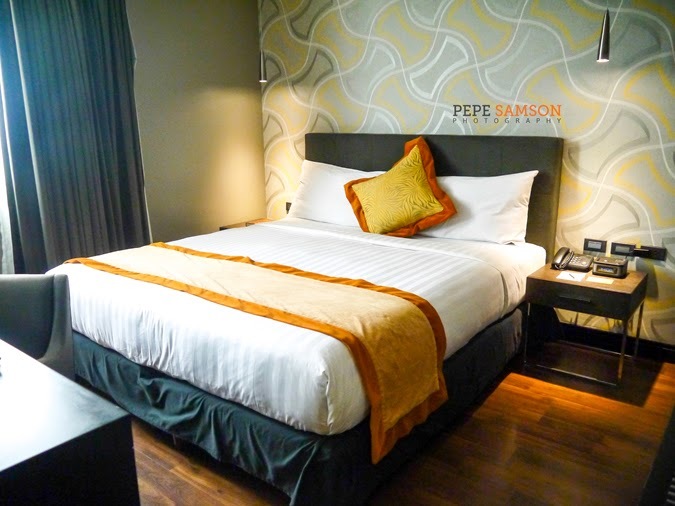 The bed was so comfortable—a perfect venue for being lazy and just watching the Food Channel all day (the only channel I can stand watching for hours)! Complimentary fruits welcomed us into our room. The room was so spacious, we could practice the Samba in it. 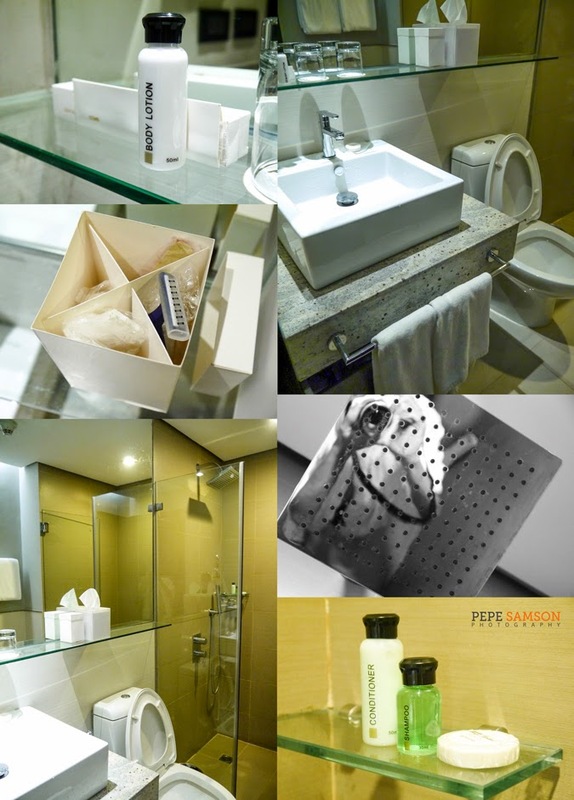 The bathroom was nice, complete with toiletries (even a razor—thank you, I totally needed a shave), towels, and a rain shower head which I vow to steal and install at home, joke. The mini-bar was equipped with a mini-refrigerator, a water heater, and complimentary beverages. I was totally excited to be lazy all day and spend time in this room. After checking in and relaxing a bit in our awesome suite, we headed downstairs to F All-Day Dining Restaurant to have our lunch. 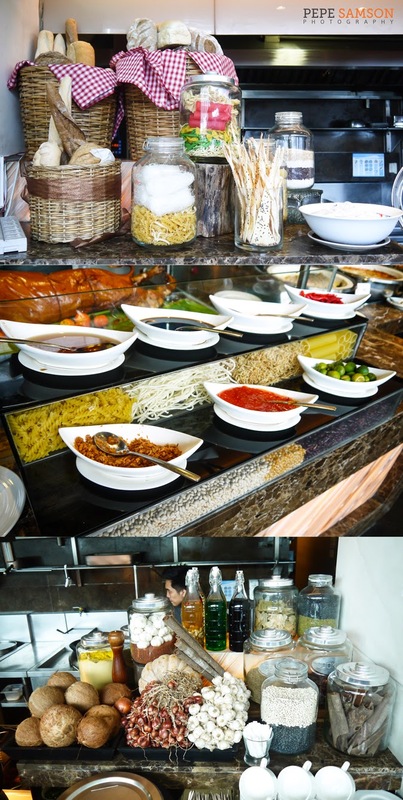 Buffets are always nice (and welcome), and F1 Hotel’s is one of the best I’ve tried. 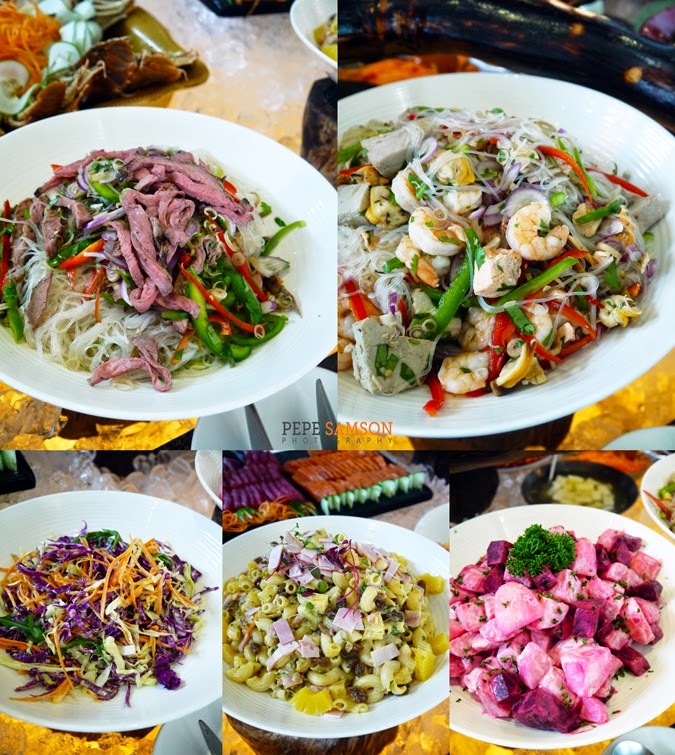 They have an extensive selection of appetizers, breads, cheeses, mains, pasta, seafood, salads, cold cuts, sushi, drinks, and desserts—that my usual glutton self stood in front of each station, frozen and unable to pick anything. 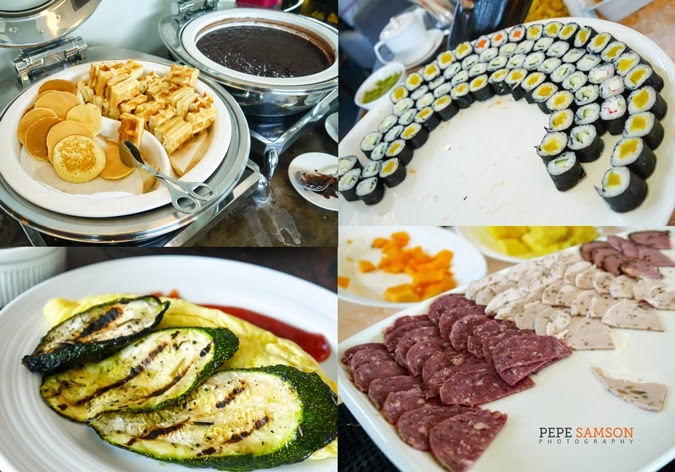 Spanish, Italian, and seafood dominate the spread; the salad and cold appetizers station was bursting with inviting colors; on one corner, scrumptious-looking desserts tempt you to end your meal already—but no, I don’t give in that easily. I started with some salads and sushi. You have to get the salmon roll with the cheese filling—it’s crazy good. The other variant, something like a beef and wasabi roll, was just as delicious. As usual, I engorged myself with salmon sashimi and ebi tempura. For the salads, you can create your own using any of the veggies and available dressings—or you can pick from any of the prepared ones, like the potato and beet salad and macaroni. Oh, and you have to HOARD the local lobsters! After that first batch, I basically piled my plate with everything, LOL. 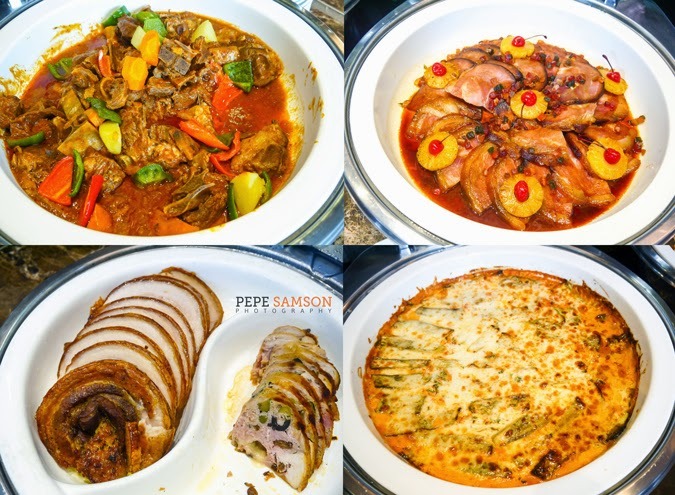 The lunch buffet features F1 Hotel’s new Christmas food items, like the Stuffed Pork Belly with Arroz Valenciana (also for sale at PhP2,200/2 kgs. )—among the many other dishes in the spread. F1’s Christmas desserts were also in the spread. I loved the light and exquisite Pandan Log Cake (also for sale at PhP1,500), which tasted as wonderful as it smelled. 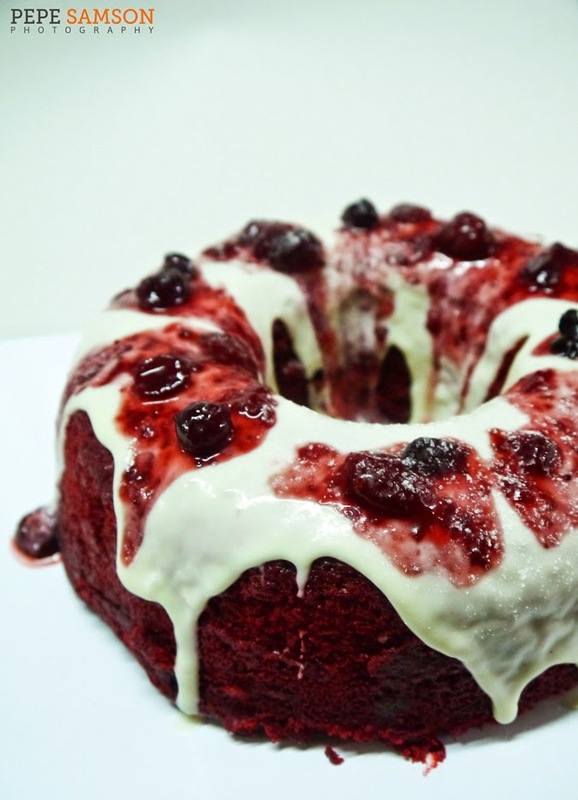 The F1 Red Velvet Savarin (PhP1,430) was another noteworthy cake, with its balanced sweetness coming from the mixed berries and the cream cheese frosting. My favorite, however, was the Quezo de Bola Cheesecake (PhP1,750)—which was so good I thought I could never leave the table. 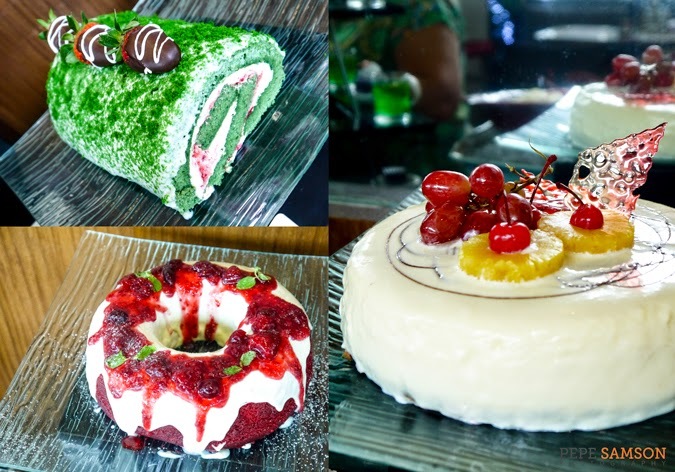 Order any (or ALL) of these cakes for your Noche Buena! 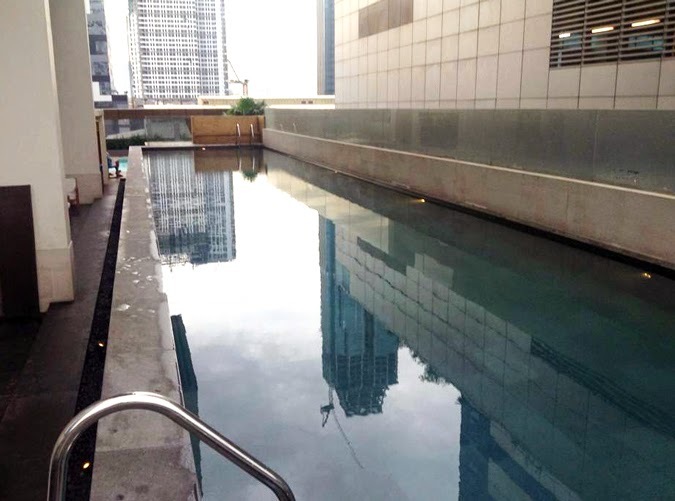 F1 Hotel has three pools to fit everyone’s preference: a kiddie pool; a regular-sized pool for older kids and great swimmers like me (hahaha); and a long lap pool which spans almost the entire width of the building. 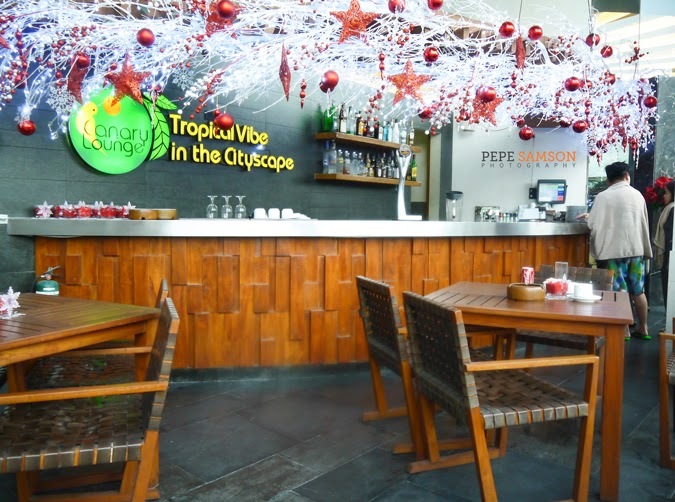 Guests can order fruit shakes and other refreshing drinks from the nearby Canary Lounge. 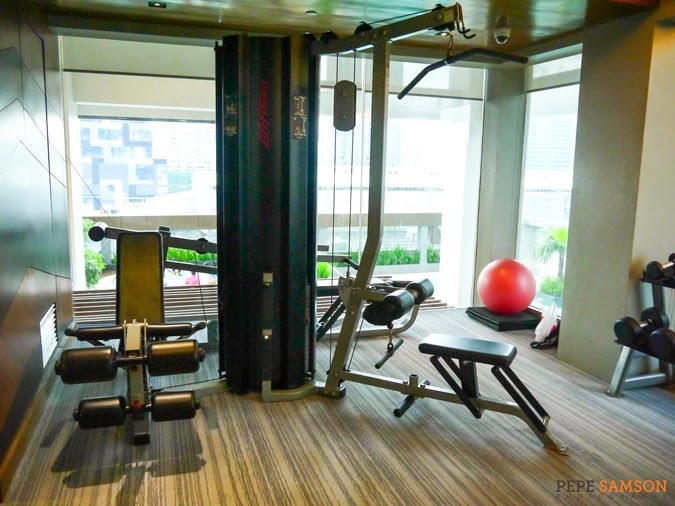 A gym and a spa sit side by side in the 3rd floor Mezzanine. 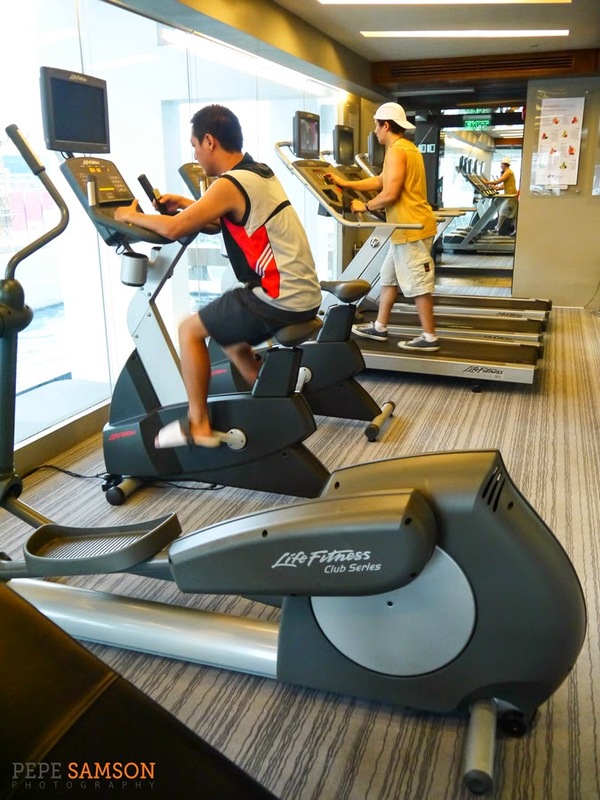 Fitness junkies who can’t let a day pass without exercise can drop by the gym anytime—it’s open for 24 hours. 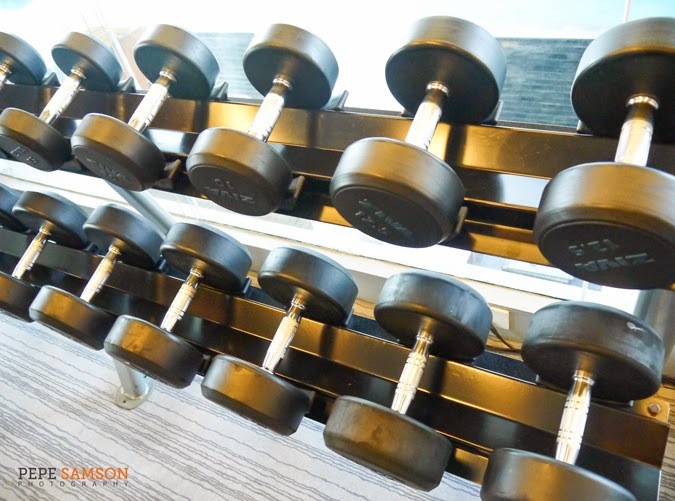 The gym is equipped with almost all the basic workout machines. 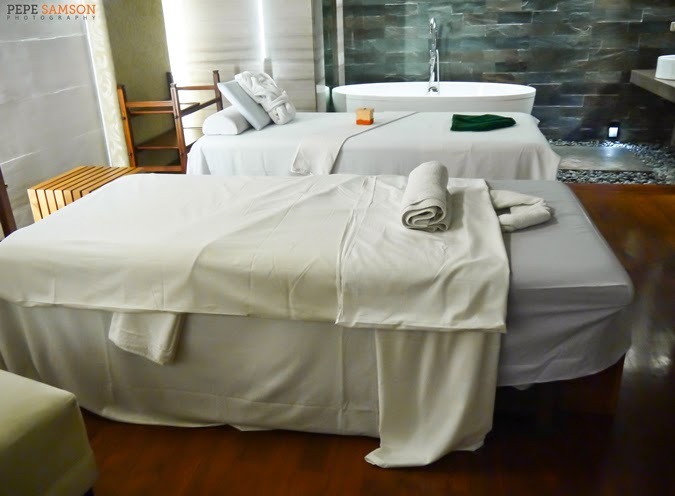 Head over to the spa if you want to get pampered with a massage and other treatments. F1 Hotel’s Christmas promo includes a 1-hour massage already, so my friend and I chose to have it in our room. I’ve been longing for a good massage for weeks, and I was glad that the masseuse totally knew what she was doing. 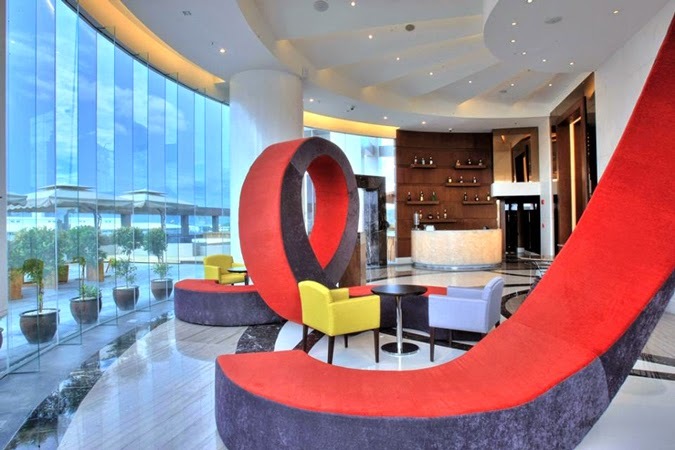 Guests who checked in can use these facilities for free—all you need is your key card! 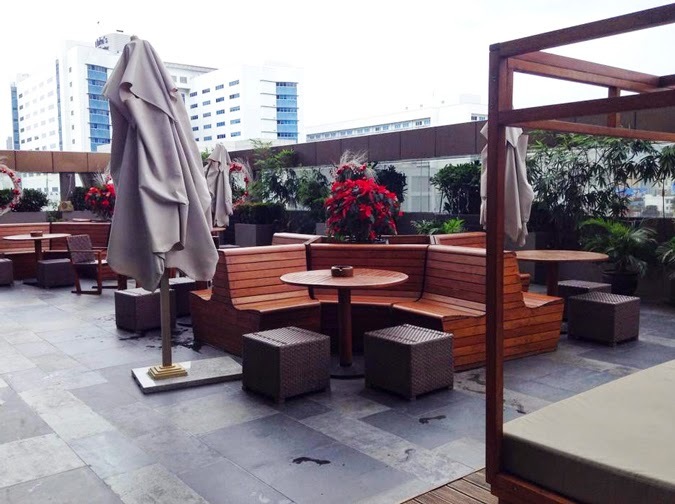 We were supposed to have a barbecue dinner at the al fresco Canary Lounge but the drizzle stopped us from doing so. Honestly, I had been looking forward to a relaxed night of grilled food and cocktails by the pool, but the friendly staff of F1 Hotel solved the problem by accommodating us inside the F Restaurant and grilling the items for us. 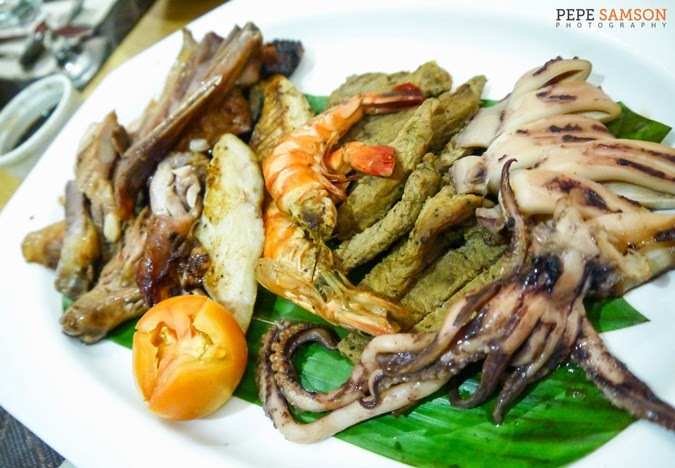 Pork, prawns, beef, salmon, squid—name your protein! We were also served some side dishes to eat our barbecue with. Then came a platter of mini-cakes and I instantly became the dessert junkie I supposedly wasn’t. The red velvet cake was filled with the most delicious dark chocolate ever. Spanky kept refilling everyone’s glasses with Bacardi—which I totally didn’t turn down. Over this dinner, I had more chance to talk to fellow bloggers and their guests and it was such a chill but totally fun night. F1 is making me fat. 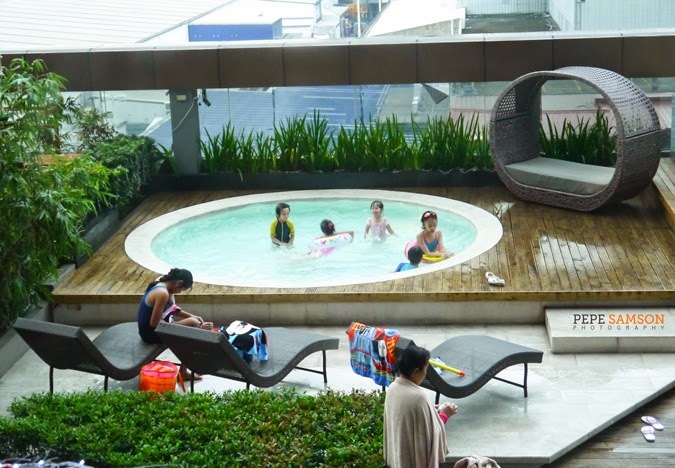 You can experience the same staycation package when you avail of F1 Hotel’s Holiday Home Christmas promo. 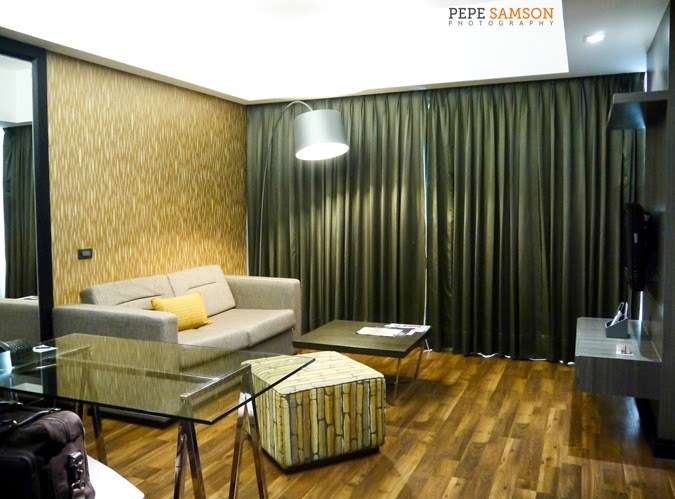 For PhP7,800++, you can stay with 3 other people at F1’s luxurious Fort Suite (regularly priced at PhP13,000++). 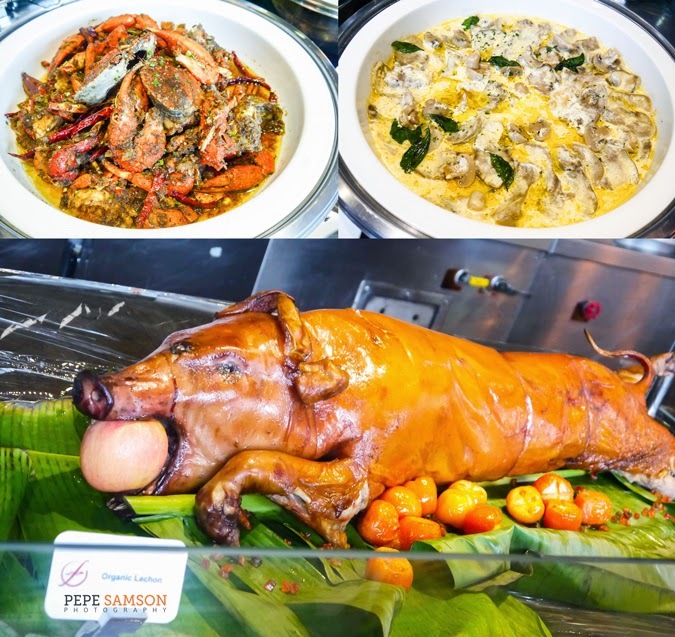 The package also includes free buffet breakfast for two, a 1-hour in-room massage for two, use of gym and swimming facilities, and PhP1,800 worth of food and drinks from F All Day Dining Restaurant or Canary Lounge. Super worth it, considering the regular price of the Fort Suite alone! 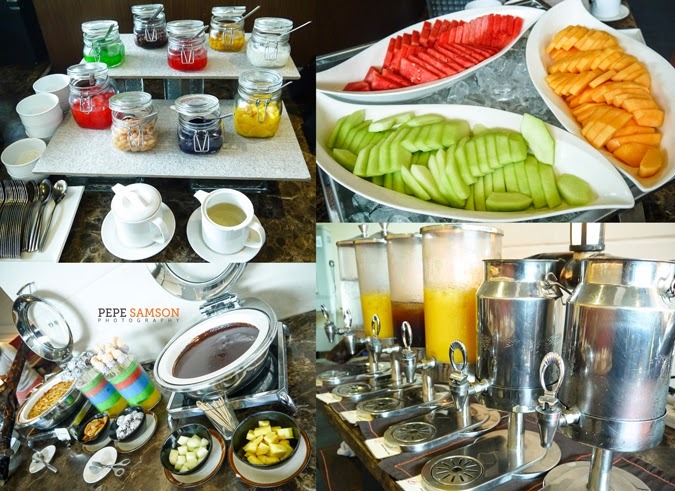 While I’m at it, let me mention that F1’s buffet breakfast was really good, unlike other hotels’. The selections are awesome–and of course, in case you’re wondering, there’s your ubiquitous deep-fried bacon! I was so excited to eat that I totally forgot to take pictures of the other dishes—but trust me when I say, it’s almost as generous as the lunch spread. 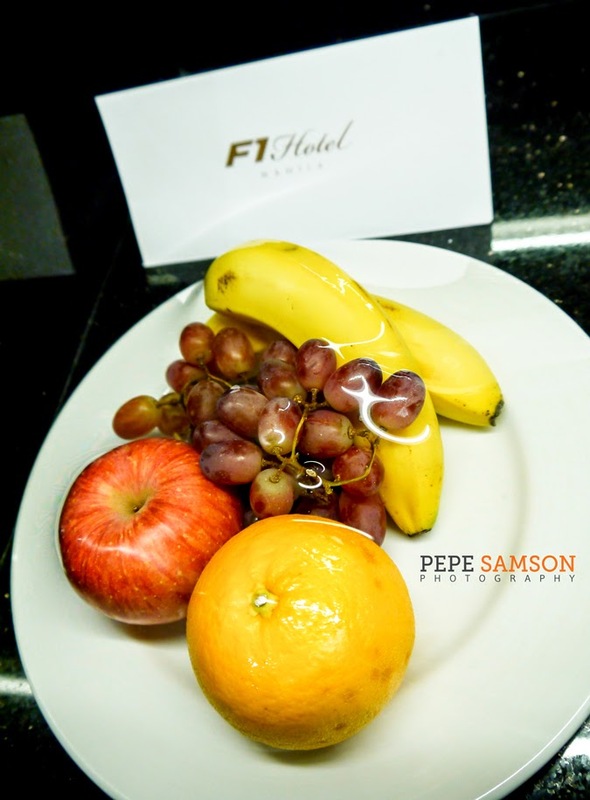 If you don’t have plans for Christmas yet, I recommend choosing F1 Hotel to be your holiday home. 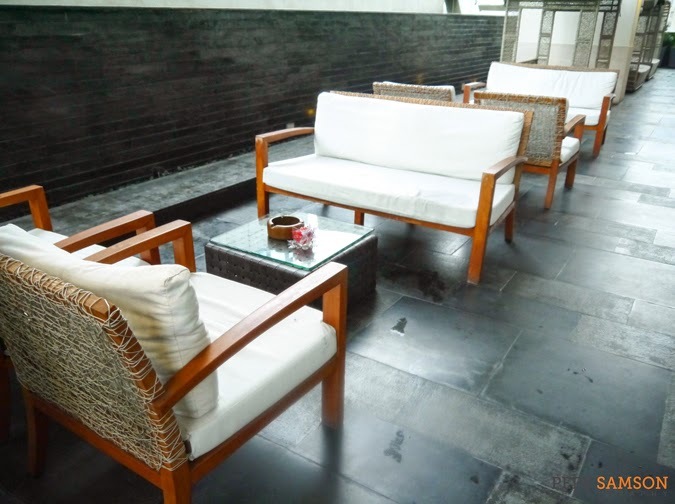 It’s the perfect venue for relaxing, getting pampered, and most importantly, just spending time with the people you love most. F1 Hotel even gave us a take-home gift: a Red Velvet Savarin which was instantly demolished at home! How do you plan to spend your Christmas? 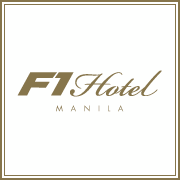 My stay was sponsored by F1 Hotel Manila. All opinions, however, are my own. *Special thanks to B'ley and Spanky!